After clearing the land, Tocal's convicts planted wheat, maize, barley and tobacco. They may have ploughed some of the land by hand with hoes, but most of the ploughing was done with teams of bullocks. Bullocks were cheaper and more readily available than horses, and estates like Tocal commonly had between three and six bullock teams working every day, with a convict in charge of each team. On Saturday last the men Worked very hard, & late, at the thrashing having in that Day thrash'd, Cleaned, & brought to the Stores, 212 Bushells of Wheat. Consequently it was late before the men had their Rations on that evening. [Letter from Tocal overseer Ralph Clarke to Tocal's owners C&F Wilson]. Tobacco was one of Tocal's main crops and by 1829 Tocal had two sheds specially built to dry and press the tobacco after harvest. In 1828 three convicts were working as tobacconists at Tocal - Daniel Callaghan, an Irish errand boy with a seven year sentence for house robbery; Richard Hughes, an English rope maker with a life sentence for burglary; and James Logan, a Scottish brush maker with a 14 year sentence for house breaking. 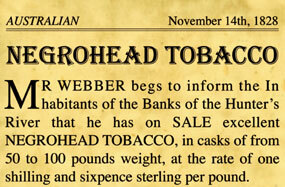 Above right: Tocal's owner, James Webber, advertised tobacco for sale. Below: a bullock team at work at Tocal.